"The woman who owned and made the soups at my favorite deli was retiring. I asked her why, and she said, 'I'm an old lady, I'm tired of getting up early for work.' She gave me the recipe to one of my favorites. I made a few tweaks, it's DELICIOUS." Cover pinto beans with water in a bowl and allow to soak overnight. Drain. Melt butter in a 6-quart stock pot over medium heat. Cook and stir onion and celery in butter until vegetables are tender, about 5 minutes. Stir garlic into onion mixture until fragrant, about 1 minute more. Stir beef broth, tomato juice, sugar, and drained pinto beans into the vegetable mixture and bring to a boil; reduce heat to medium-low and simmer until beans are tender, about 1 hour and 15 minutes. Mix potatoes, carrots, oregano, salt, and black pepper into the bean soup; simmer until potatoes are tender, about 30 minutes more. Place smoked sausage on a baking sheet. Bake sausage in the preheated oven until browned, about 10 minutes. Cut sausage into quarters, then slice. 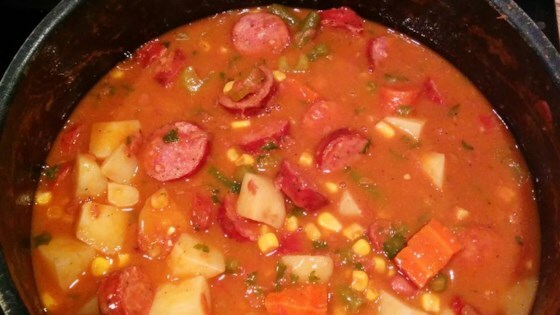 Add sausage and parsley to the soup; continue to simmer for 10 more minutes. After I broil and cut the sausages I pat down in paper towels to remove some of the grease.